Since his mother’s death six years ago, Carter Kane has been living out of a suitcase, traveling the globe with his father, the brilliant Egyptologist Dr. Julius Kane. But while Carter’s been homeschooled, his younger sister, Sadie, has been living with their grandparents in London. Sadie has just what Carter wants — school friends and a chance at a “normal” life. But Carter has just what Sadie longs for — time with their father. After six years of living apart, the siblings have almost nothing in common. Until now. 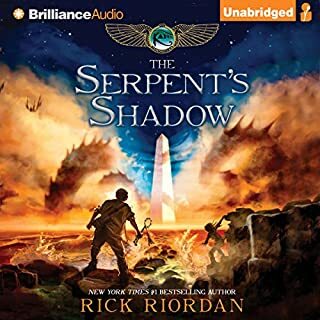 Soon Carter and Sadie discover that the gods of Ancient Egypt are waking, and the worst of them — Set — has a frightening scheme. 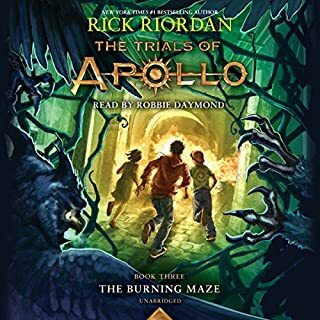 To save their father, they must embark on a dangerous journey — a quest that brings them ever closer to the truth about their family and its links to the House of Life, a secret order that has existed since the time of the pharaohs. 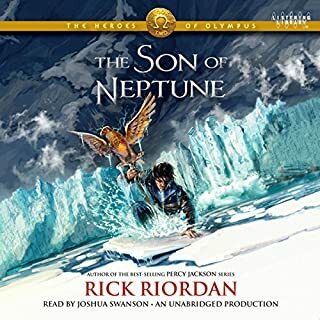 ©2010 Rick Riordan (P)2010 Brilliance Audio, Inc.
At the end of our trip, the seven year olds asked if we could stay in the car in the driveway to hear more.... the best praise for an audiobook I can possibly imagine. A marvelous listen. 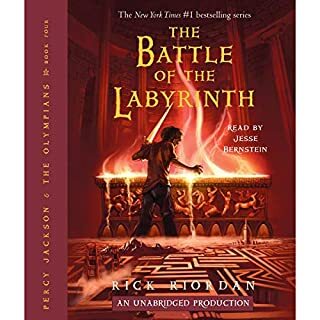 Riordan's new series after completing the Percy Jackson one last year is a terrific adventure tale. This time, it is the Egyptian gods that are on the loose and at the heart of the story, a brother and sister. Fast paced than the Jackson series in some regards, this one excels from two excellent voice actors, each playing one of the main characters. Although targeted for early teens, it is still an adventure any lover of the genre will enjoy. Great author, great narrators. Excellent! 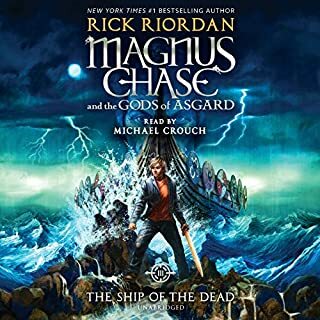 After thoroughly enjoying Riordan's Percy Jackson series, and have been a huge fan of Katherine Kellgren's narration in the Bloody Jack series, I knew this book was going to be great and I wasn't disappointed. The format of banter between siblings was delightful and added humor to tense moments. The suspense was prickly, the plot well thought out with enough detail to cast mental images very well! I can't wait for the next one to come out! 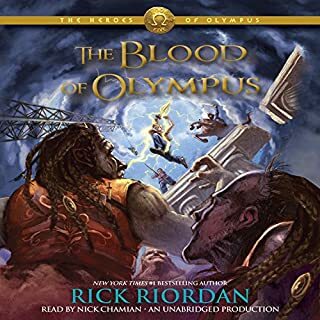 Like LA Meyer's Bloody Jack series, Riordan's books are the few that I listen to more than once! 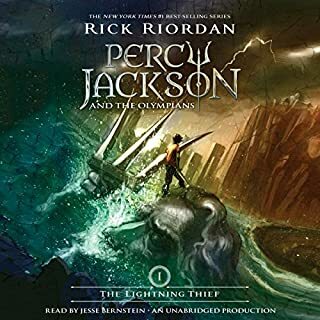 I loved the Percy Jackson series so I knew this would be good. But I didn't know just how good it would be. Turns out it was full of surprises and twists that keeps you guessing until the very last page. 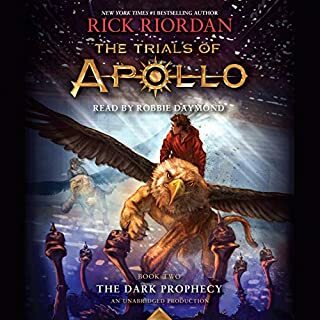 Just like with the Percy Jackson series you get a refresher course in & learn more about mythology; this time Egyptian. Both Carter & Sadie Kane are fantastic main characters. Both strong and smart for their ages of 14 and 12 without being unrealistic. 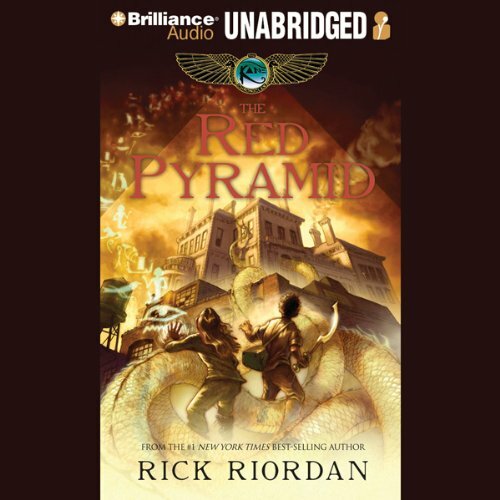 The Red Pyramid is not only captivating but hilarious too. You shut the book wanting more. This is definitely a book for all ages. I think Katherine Kellgren nailed the reading, as usual. I did not realize the target reading group was teens untill after i started listening, but even so i enjoyed every minute. I dont usually post these things, but i absolutely could not believe someone ranked it one star due to the naration of the female side of the story. 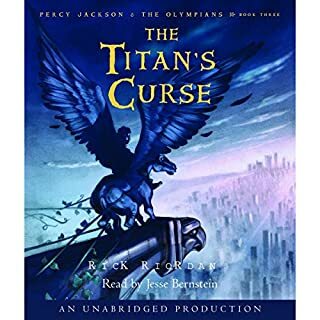 I really enjoyed Riordan's Percy Jackson series and decided to give this book a try regardless of the mixed reviews. I wasn't surprised at all to find that I highly enjoyed the book. I wasn't sure about having two narrators, but it worked out alright. 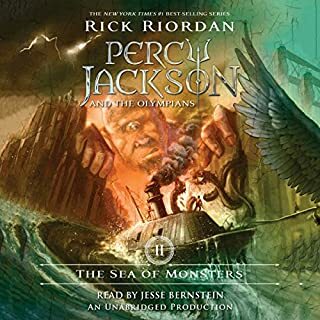 I thought they did a much better job than the narrator for the Percy Jackson books. I'm always on the lookout for child-friendly books that I can listen to around my two toddlers yet still be interested- this definitely fills the bill. I did not find the book dark or disturbing. It was highly enjoyable. I think this book is great and the narrators where fantastic. It was hard not to laugh out load on my commute on the train. 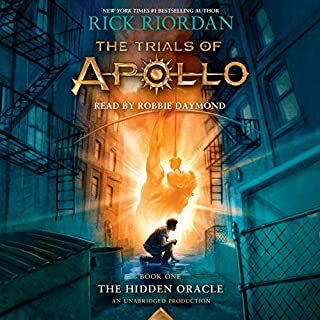 I've read every one of Rick Riordan's books, and think with every book he's writting gets better. This is book really brough out my inner child, of course accourding to my wife that's not hard. 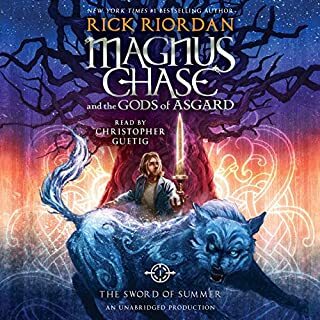 I would recommend this book to anyone who enjoys mythology and childrens books. I wanted a good but fun story to listen to. 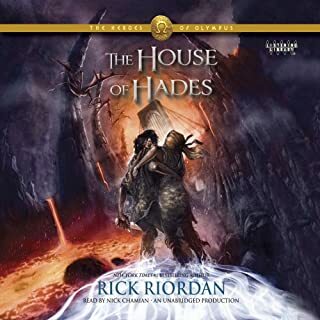 I found it with this audio book. 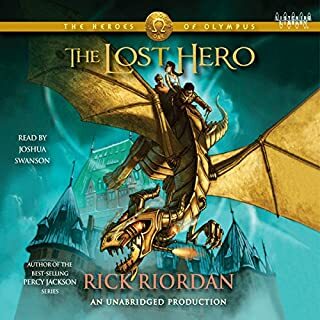 Although targeted to young teens...and I am hardly a teen...it was a good listen for people who enjoy a little fantasy, history, and a bit of sarcasm! I really enjoyed the story - full of action, wit and some really over-the-top voices for certain characters. It was great. 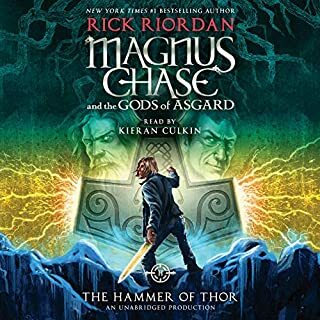 The narrators were enjoyable and I could envision the two teen heroes of the story. I am looking forward to the next book. 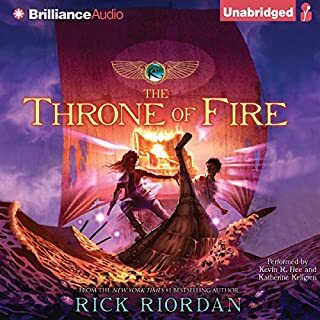 Althougth I had some tough time getting used to the British accent of the female narrarator, I liked(once again) Rick Riordan's idea of combining ancient Egypt, fantasy, and the modern world altogether. 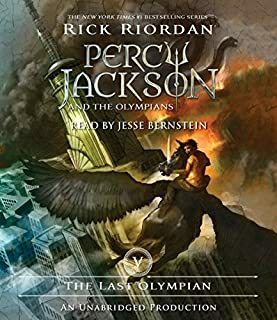 However, I think that this story was too familiar to Percy Jackson. And it would have been better if the characters were more, what should I say? ummm... strong and special in some way. The two narrators for this book did a terrific job. 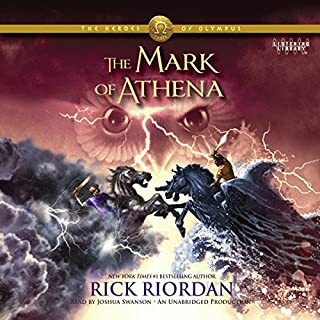 As an adult listener, I found the plot a bit confusing with too much action and too many characters for me to keep track of. My 11-year old son didn't have those problems though, and as he is the target audience, I give the book high marks.